Prayers that soaking/blocking really is magic for weaving, just like it is for knitting. 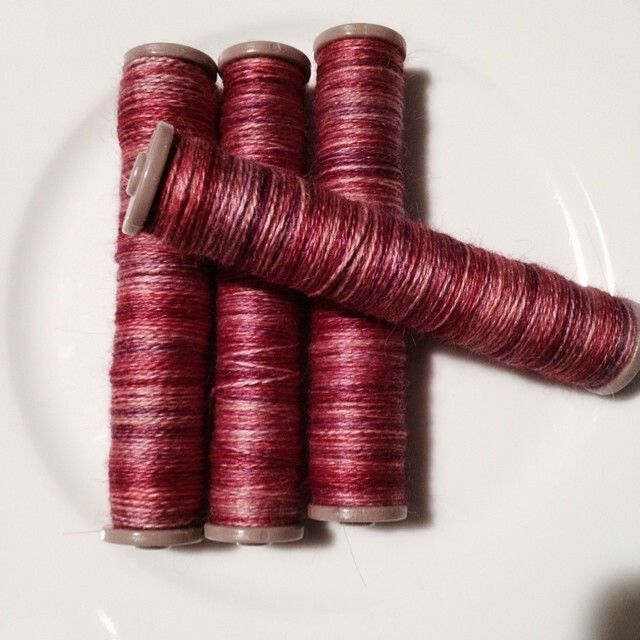 I started my first laceweight weaving project Friday night. Shireen came over for a visit and offered to help me warp up my loom with some Malabrigo Silkpaca in “Archangel” she gave me. Since I always find warping to be the most intimidating part of weaving, I took her up on her offer. We moved some furniture and warped up a nice long, if narrow scarf-like piece. It’s amazing how fast 440 yards goes! Since she gave me two skeins of this lovely stuff, we decided I would weft with the other skein. This meant I was free to practice without fear of making any sort of colour choices/mistakes. So I wound the entirety of the second skein onto the bobbins for my boat shuttle (Shireen brought with her the prototype of an amazing machine that Tito made to help with that most boring of tasks) and got ready to go. I got started with my leader yarn, and for some reason that seemed to take a LOT of yarn. The gaps didn’t seem to want to close at all. Once I did get them closed up, I started with my boat shuttle and words cannot express how much more enjoyable using that shuttle is, compared to the basic stick ones that come with the loom. I had a problem with the left side of my shed…however I tied it, it seemed sorta loose and wimpy and there are a few inadvertent floats as a result. 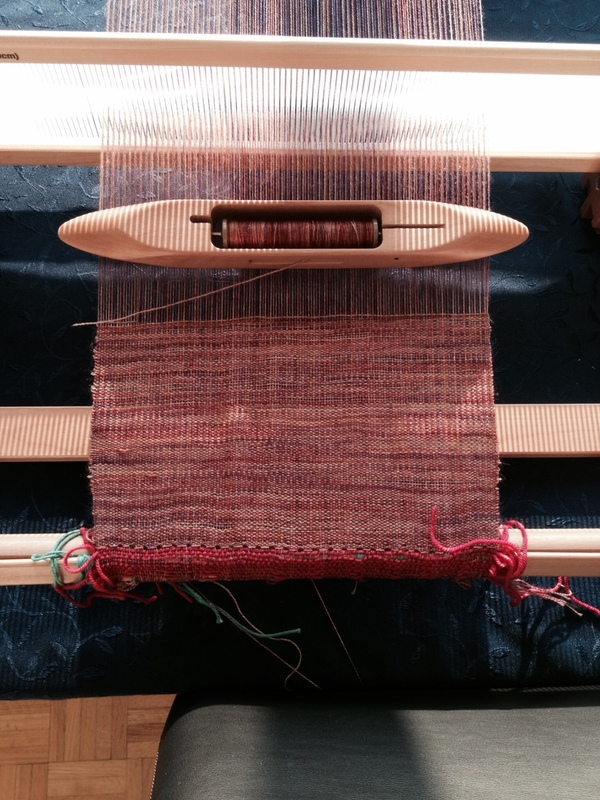 But the bigger issue I encountered was not being able to get the weft to stay put. I’d beat it down, and it would bounce back up. I assumed either I was doing something wrong, or the silk in the yarn was rendering it so slippery that the threads just weren’t sticking together. I messaged Shireen to ask her what I was doing wrong and her response was not to think of it as beating it down but rather “think of it as placing it on a line that is an equal distance from the one below it.” I tried that, but I admit that I still wasn’t too successful. That being said, I am fairly sure that the method I used to attach the warp to the apron bar rendered the start of the piece somewhat uneven. 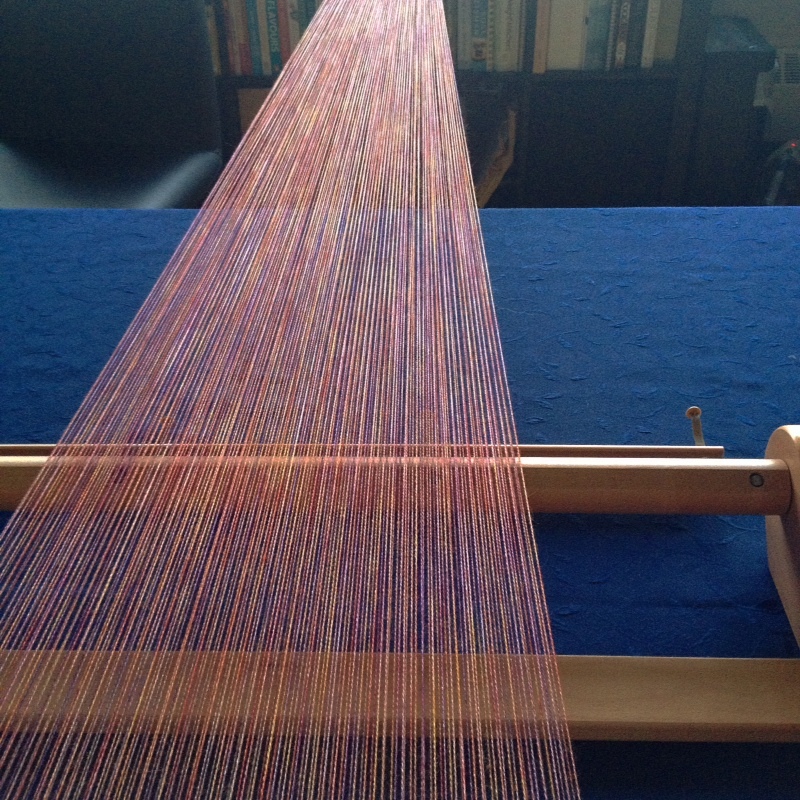 I have already decided that even if it means less loom waste, I won’t be trying that method again. So by the end of the weaving time on the weekend, this was what I had. It’s way uneven (there are all sorts of gaps and you can see where the weft threads are actually wavy over on the right) and the edges are pretty ratty looking. But, it’s also my first laceweight piece and I am hoping I (and it) will get better as the piece progresses. Besides, that s$%# will totally block out, right? This entry was posted in Uncategorized and tagged archangel, ashford, loom, malabrigo, rigid heddle, silkpaca, warp, weaving by Rayna. Bookmark the permalink.